Middlesbrough star Stewart Downing admits that his side cannot afford a costly slip-up in the search for a Championship play-off place. 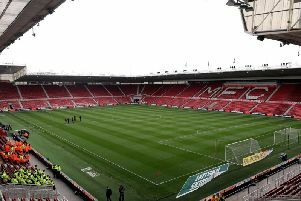 Boro start their Easter programme with a tough task tomorrow, as table-toppers Wolves visit the Riverside for a 5.30pm kick-off. And Downing anticipates a Good Friday cracker, with Boro determined to at least maintain their slot in the play-off places. Nuno Espirito Santo’s Wolves, meanwhile, need 12 points maximum from their final eight games to clinch promotion. They are six points above second-top Cardiff, and 13 clear of third-placed Fulham. Downing told mfc.co.uk: “They’ll (Wolves) want to get it over the line as quick as possible, so it makes out for an exciting game. “We need the points because we are in the play-offs and we need to stay there. “We can’t afford to slip up because there’s teams breathing down our necks, so we just need to keep going and tick along. “There’s eight games to go, it’s crunch time really. “We’ve been on a decent run to get in the position we want to be in now and it’s all about staying there. The sides met on the opening weekend of the season, when Leo Bonatini’s goal proved enough for the Molineux men to edge a hard-fought 1-0 victory. After tomorrow, Boro head to lowly Burton on Monday.